“Beyond the Standard Model” or BSM has become this years trending phrase in particle physics as the Tevatron, the Large Hadron Collider and a range of passive particle physics experiments battle it out to see who will find the first conclusive signs of physics that cannot be explained within the parameters of the Standard Model of particle physics. There may already be some signs of BSM physics from the Tevatron where matter/anti-matter asymmetry is more consistent with a multiple Higgs sector as predicted by supersymmetry. Now attention is focussed on the Large Hadron Collider where the exponential growth in accumulated collision events at energies 3.5 times higher than the Tevatron, means that new physics could surface there at any moment. When it does they may take months to analyse it carefullty before they dare make an announcement, but negative results can be released tentatively much quicker and will appear at the never-ending series of particle physics conferences. The conference that is currently running is the HCP symposium in Toronto and yesterday morning was the time for BSM physics reports from the Tevatron and the LHC. 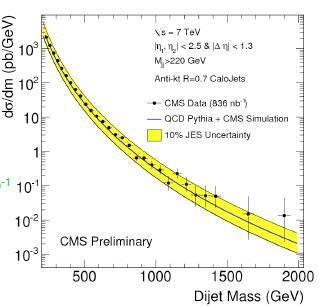 The talks about BSM physics from the ATLAS and CMS experiments were the most interesting. There were no positive results shown, but there were new plots using more data with some new limits set of BSM parameters. Only the slides are online with no video and I am no expert on interpreting particle experiment plots, but at least some information is clear from the slides. The CMS talk by Sung-Won Lee had the most to show. This plot of dijet events does up to 1.9TeV using 836/nb. This will be one to watch as more data is accumulated. For more see the slides yourself on the symposium website. This entry was posted on Friday, August 27th, 2010 at 2:26 pm and is filed under Conference, Large Hadron Collider, Tevatron. You can follow any responses to this entry through the RSS 2.0 feed. Both comments and pings are currently closed.